Warning: Please make sure you have a backup copy of your firmware. Warning: Please make sure backup all your important data. Warning: Your warranty may get void once doing this process. Warning: Recommended to install SuperUser app to get prompt permission when launching an apps with root level. 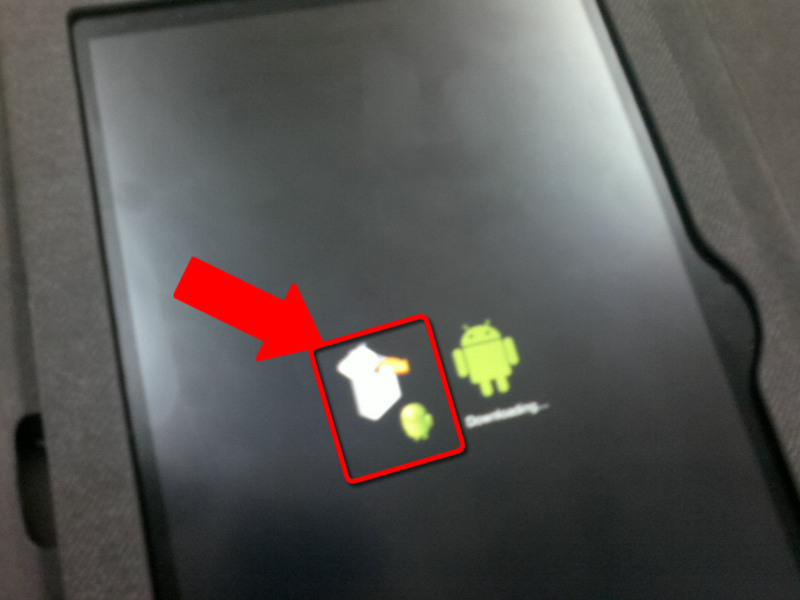 Warning: I did on Samsung Galaxy Tab 8.9 P7300 + Android 3.1 (Honeycomb) ONLY. Never try yet on other devices. Disclaimer: The author of this write-up do not take any responsibilities for any damage causes by this action. 1. First of all download this file package first. 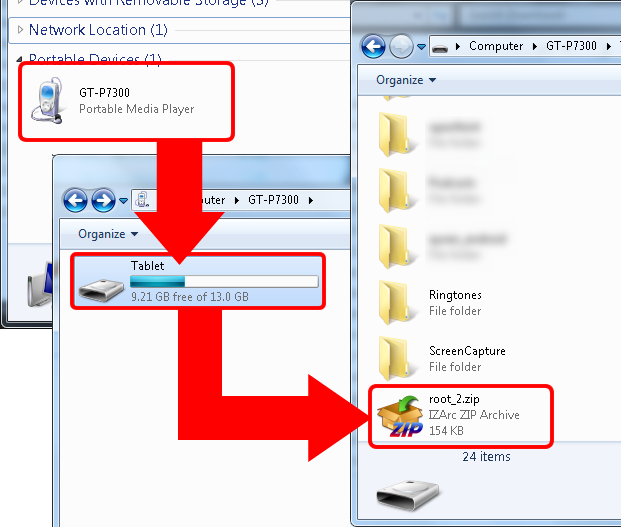 Download here >> root_2.zip. 2. Put the root_2.zip into the root directory (No need to extract). 3. Turn OFF your device. 4. Then turn ON your device by holding Power and Volume Down button. Repeat this process if you are not successful. 5. If success, you'll get two icon on the screen which is Recovery and Download Mode. See picture above. 6. Choose Recovery Mode on your left by pressing Volume Down button then press Volume Up button for confirmation. 7. Choose 'apply update from /sdcard' by using your volume up/down button. Make sure you choose the 'root_2.zip' on your root storage. Then press Power button to confirm. 8. You will get 'Install from sdcard complete' message if successful. 9. 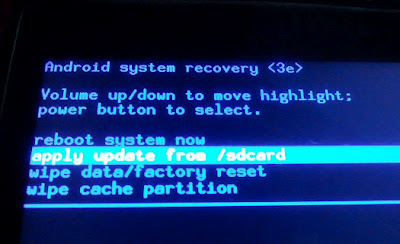 Now choose 'reboot system now' to restart your device. Your device should be rooted now. 10. You can verify whether your device is successful rooted or not by opening Terminal console and type 'su' and ENTER. Then type 'id' and ENTER. You'll see your user id now is 'root' as shown in image below. At this point any software that need a higher access level will be able to install and run as a root privilege. For example VPNC Widget, Samba Filesharing, Superuser and so on. Have a nice day. Another two devices from a friend of mines which is using Samsung Galaxy Tab 7.0+ and Samsung Galaxy Tab 10.1 seem to be work with those step. Is this procedure good for honeycomb 3.2? @Raffaele: Another two devices from a friend of mine (Samsung Galaxy Tab 7.0+, 10.1) seem to be work with these procedure. As I see on Honeycomb 3.2, pretty much work fine on it. Just make sure install SuperUser apps to protect from unauthorized software access to the root without permission. 1. Yes, it is work and exactly same device as yours. I'm using Samsung Galaxy Tab 8.9 with Wifi and 3G. Have you check the root id through terminal command line? If it says 'root' then you're rooted already.. I am new at this. Please how do I backop my device firmware? I have a GT P7300 with android 3.1 and baseband version P7300XXKHC. I tried to write su but permission denied, can you give me a solution?